Video Conferences have proven to be an important and versatile tool for business. It can be used for online business meetings, job interviews, product demos, meetings with clients, educational seminars, webinars and so on. But with its advantages, come also some unforgivable video conferencing mistakes. Although “being late” is one of the most obvious video conferencing mistakes, it still happens a lot and needs to be addressed. As in any business meeting, job interview or presentation, being late for a video conference hurts your credibility. Being there on time shows your coworkers, superiors and clients your respect of their time. The idea behind an online conference is to save time and not waste it. If you are the host of the conference, go even further, and be there earlier, that will also give you a chance to test your presentation one more time. Regardless of the purpose of your video call, the key to success is to get everyone engaged. Some might think that it’s better to say everything they have to say, to end things faster and save everyone some time. However, by doing so, you run the risk of losing people’s attention and they probably won’t remember a word you said. To avoid this video conferencing mistake, allow the other attendees to interact with you, by asking them questions, or getting them to ask you questions. Having a group chat room can also improve the interaction. These simple actions will get everyone engaged with the subject at hand. Too many movements and gestures on camera can be distracting, or even annoying. These movements appear differently on the other side of the screen and can completely ruin your conference. Instead of shifting in your chair, moving suddenly or using exaggerated gestures, make sure you’re calm and composed while delivering your presentation. This way, the other attendees will understand you better and you’ll seem to be more confident. When choosing a place, it’s also important to keep in mind the “set”. What’s going to be on the background when you are on camera? Be careful not to have too many distractions and check if the lighting is appropriate or if you’ll need to add other lights. If you use your laptop’s mic and speakers or have external equipment but position them poorly, your speakers will create feedback in the video. Which means, the sound that comes out of the speaker goes back to the microphone and people can hear themselves. It can be really distracting. To avoid video conferencing mistakes like this one, you can use a headset with a microphone. It’s also a solution to have just the earphones and an external microphone. This way the sound won’t get it the way. There are software products, like ManyCam, that have noise reduction and other useful settings. Learn more about ManyCam’s features. 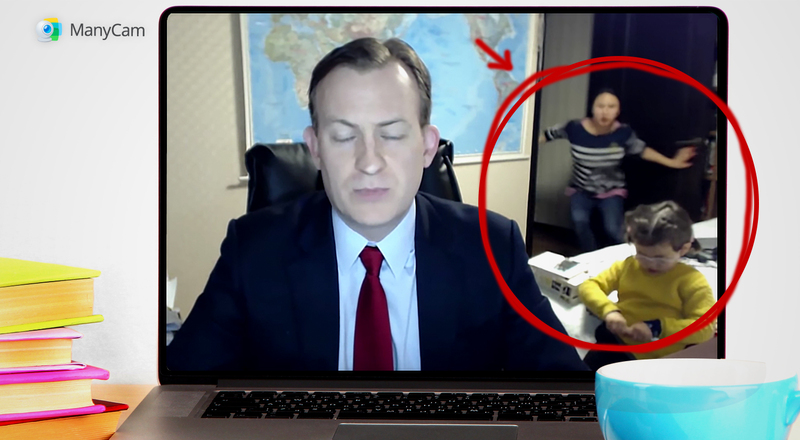 It’s a very common video conferencing mistake to talk louder or even shout if someone can’t hear us well. We instinctively do that in person and on the phone. Instead, we should look for the problem and fix it, if it’s on your end or help the attendee fix on their end. Dealing with technical difficulties is a massive challenge, because you cannot let it affect your confidence or delivery. Having someone by your side or participating in the video conference assigned to help you with any technical problems can help a lot. Long gone are the days you had to turn the camera to your computer to show your screen, or move the camera to show different things. Now, you can simply share your screen with the other participants. The cameras are more affordable, so you can have more than one. You can even use your phone as a video source for your conference. For example, on ManyCam you can add 12 different video sources or use the picture in picture feature and have everything ready before you start your meeting. And to make sure you avoid this video conferencing mistake, you can share your entire screen , parts of your screen or even one specific app. Preparation is crucial to have a successful video conference. Before your conference, create an outline of everything that will be addressed in a logical order. Getting everyone on the same page before the meeting will make it more objective and effective. Therefore, don’t forget to inform everyone about the conference agenda in advance, so they know what to expect from the conference. When preparing, keep in mind this live streaming checklist, to get your equipment and everything else ready! If you keep in mind these video conferencing mistakes and do your best to avoid them, you will have a successful conference. Remember, with anything that is live, a few things almost always go wrong. Being flexible when dealing with these mishaps is the most important thing you can do, every time. To find out if your video calls are good enough and learn a few more tips and tricks go to this blog post: Are your video calls good enough? What is RTMP and Why Does it Matter for Your Live Stream?